The 500T Mechanical Truck Mount has a maximum payload of 14,000 lbs (6,350 kg), struck capacity of 480 ft³ (13.6 m³) or 555 ft³ (15.7 m³) with tub extension, and requires 210 horse power (157 kW). 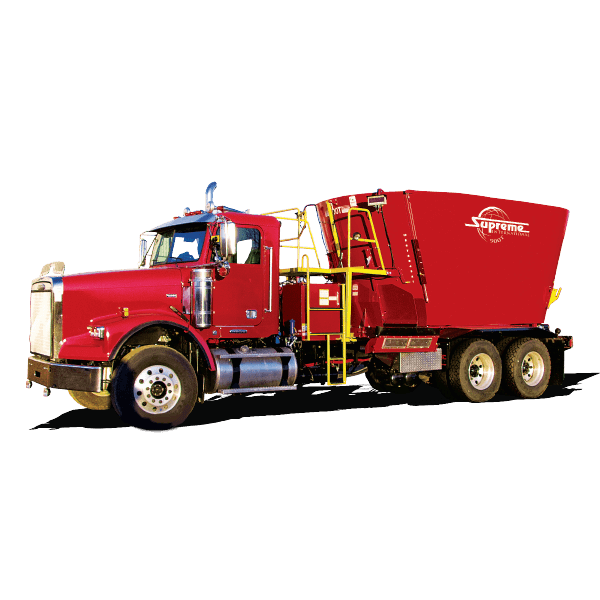 Supreme Mechanical Truck Mount processors use a similar drive system to our mechanical pull types, and include features like HD 2 stage planetaries, AR200 walls, and our patented tub and auger design. The 500T model is also available as a pull type and a stationary mixer. The 600T Mechanical Truck Mount has a maximum payload of 14,000 lbs (6,350 kg), struck capacity of 549 ft³ (15.5 m³) or 641 ft³ (18.2 m³) with tub extension, and requires 260 horse power (194 kW). 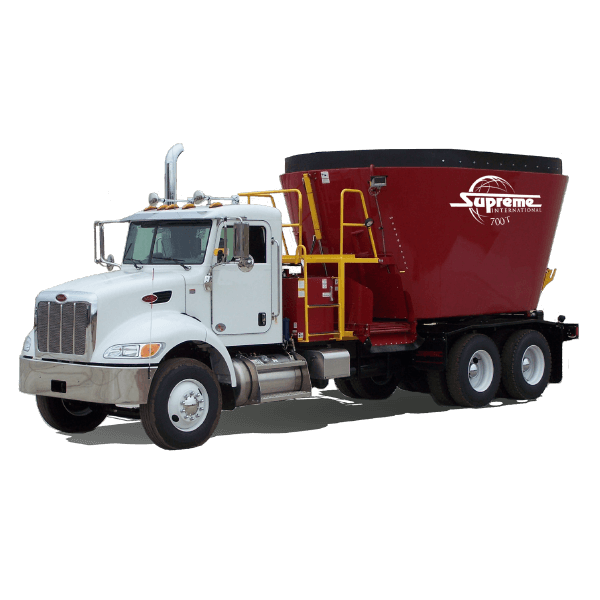 Supreme Mechanical Truck Mount processors use a similar drive system to our mechanical pull types, and include features like HD 2 stage planetaries, AR200 walls, and our patented tub and auger design. The 600T model is also available as a pull type and a stationary mixer. The 700T Mechanical Truck Mount has a maximum payload of 14,000 lbs (6,350 kg), struck capacity of 568 ft³ (16.1 m³) or 649 ft³ (18.4 m³) with tub extension, and requires 260 horse power (194 kW). 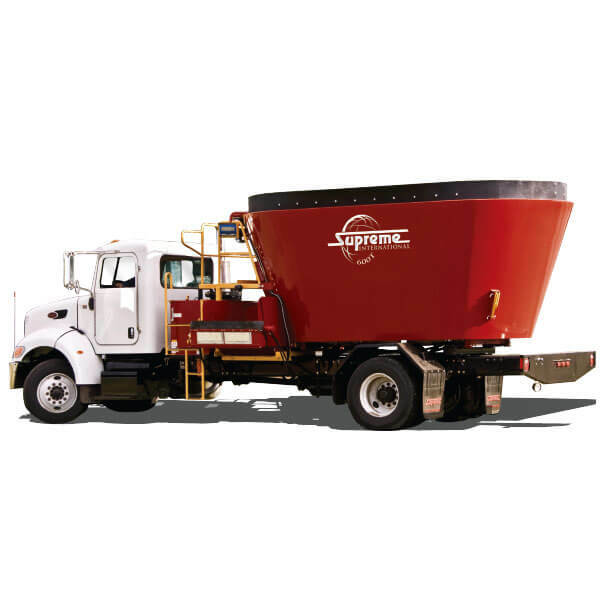 Supreme Mechanical Truck Mount processors use a similar drive system to our mechanical pull types, and include features like HD 2 stage planetaries, AR200 walls, and our patented tub and auger design. The 700T model is also available as a pull type and a stationary mixer. The 600T Hydrostatic Truck Mount has a maximum payload of 14,000 lbs (6,350 kg), struck capacity of 549 ft³ (15.5 m³) or 641 ft³ (18.2 m³) with tub extension, and requires 250 horse power (186 kW). This Supreme Hydrostatic Drive Truck Mount Model is available with a Front Engine PTO or Rear Engine PTO configuration, and uses some of the heaviest hydrostatic drive motors and pumps in the industry. Unlike competition, Supreme Truck Mounts use full size hydrostatic motors to drive the augers. These trucks give the operator variable auger control and high speed RPM functionality. The 600T model is also available as a pull type and a stationary mixer. The 700T Hydrostatic Truck Mount has a maximum payload of 14,000 lbs (6,350 kg), struck capacity of 568 ft³ (16.1 m³) or 649 ft³ (18.4 m³) with tub extension, and requires 250 horse power (186 kW). This Supreme Hydrostatic Drive Truck Mount Model is available with a Front Engine PTO or Rear Engine PTO configuration, and uses some of the heaviest hydrostatic drive motors and pumps in the industry. 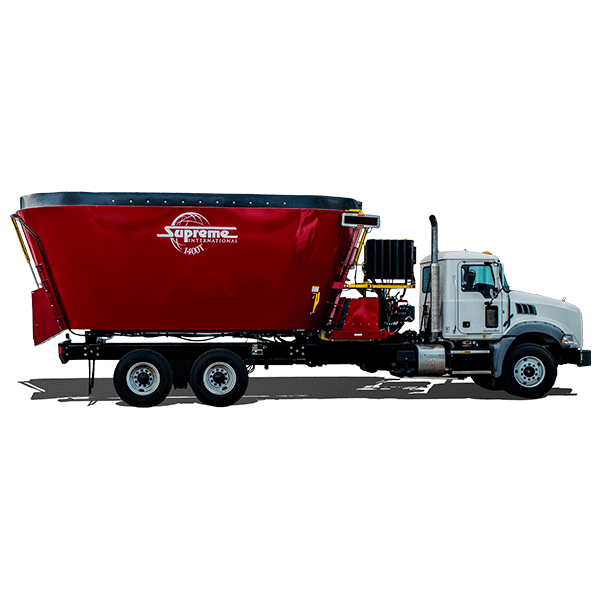 Unlike competition, Supreme Truck Mounts use full size hydrostatic motors to drive the augers. These trucks give the operator variable auger control and high speed RPM functionality. The 700T model is also available as a pull type and a stationary mixer. The 900T Hydrostatic Truck Mount has a maximum payload of 24,000 lbs (10,886 kg), struck capacity of 739 ft³ (20.9 m³) or 849 ft³ (24.0 m³) with tub extension, and requires 300 horse power (223 kW). This Supreme Hydrostatic Drive Truck Mount Model is available with a Front Engine PTO or Rear Engine PTO configuration, and uses some of the heaviest hydrostatic drive motors and pumps in the industry. 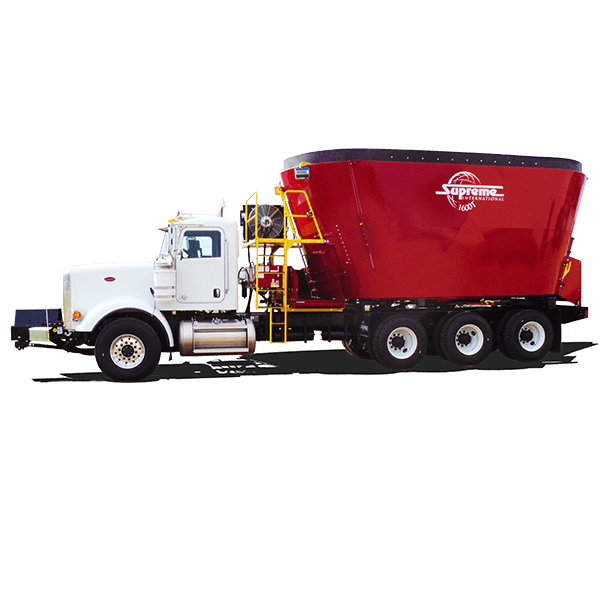 Unlike competition, Supreme Truck Mounts use full size hydrostatic motors to drive the augers. These trucks give the operator variable auger control and high speed RPM functionality. The 900T model is also available as a pull type and a stationary mixer. The 1000T Hydrostatic Truck Mount has a maximum payload of 30,000 lbs (13,608 kg), struck capacity of 789 ft³ (22.3 m³) or 906 ft³ (25.7 m³) with tub extension, and requires 350 horse power (257 kW). This Supreme Hydrostatic Drive Truck Mount Model is available with a Front Engine PTO or Rear Engine PTO configuration, and uses some of the heaviest hydrostatic drive motors and pumps in the industry. Unlike competition, Supreme Truck Mounts use full size hydrostatic motors to drive the augers. These trucks give the operator variable auger control and high speed RPM functionality. The 1000T model is also available as a pull type and a stationary mixer. The 1200T Hydrostatic Truck Mount has a maximum payload of 40,000 lbs (18,144 kg), struck capacity of 917 ft³ (26.0 m³) or 1038 ft³ (29.4 m³) with tub extension, and requires 370 horse power (276 kW). This Supreme Hydrostatic Drive Truck Mount Model is available with a Front Engine PTO or Rear Engine PTO configuration, and uses some of the heaviest hydrostatic drive motors and pumps in the industry. Unlike competition, Supreme Truck Mounts use full size hydrostatic motors to drive the augers. These trucks give the operator variable auger control and high speed RPM functionality. The 1200T model is also available as a pull type and a stationary mixer. The 1400T Hydrostatic Truck Mount has a maximum payload of 40,000 lbs (18,144 kg), struck capacity of 1,157 ft³ (32.8 m³) or 1,312 ft³ (37.2 m³) with tub extension, and requires 400 horse power (298 kW). This Supreme Hydrostatic Drive Truck Mount Model is available with a Front Engine PTO configuration, and uses some of the heaviest hydrostatic drive motors and pumps in the industry. Unlike competition, Supreme Truck Mounts use full size hydrostatic motors to drive the augers. These trucks give the operator variable auger control and high speed RPM functionality. The 1400T model is also available as a pull type and a stationary mixer. The 1600T Hydrostatic Truck Mount has a maximum payload of 40,000 lbs (18,144 kg), struck capacity of 1,325 ft³ (37.5 m³) or 1,480 ft³ (41.9 m³) with tub extension, and requires 425 horse power (317 kW). This Supreme Hydrostatic Drive Truck Mount Model is available with a Front Engine PTO configuration, and uses some of the heaviest hydrostatic drive motors and pumps in the industry. 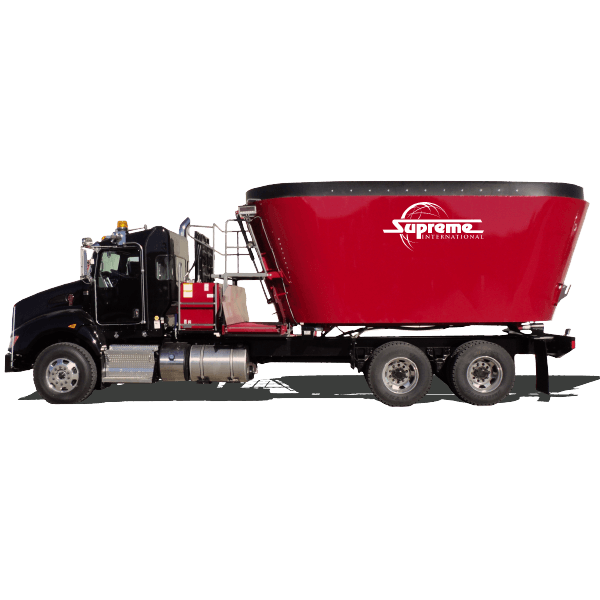 Unlike competition, Supreme Truck Mounts use full size hydrostatic motors to drive the augers. These trucks give the operator variable auger control and high speed RPM functionality. The 1600T model is also available as a pull type and a stationary mixer.